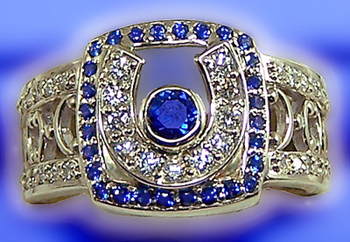 "Horseshoe Diamond and Sapphire Ring"
The Gorgeous Horse, your destination for custom equestrian jewelry. Check out this new design, redefining elegance and beauty for the equestrian enthusiast. This piece could pass for high end fashion or the horse lover in you. Boasting with half a carat of diamond cut sapphires, and three quarter carat of matching brilliant cut diamonds. Dimensions: 13mm wide from the top, tapering down to a 6mm band. Set with .75ct SI, I2 matching diamonds and AAA diamond cut sapphires. Use our comments requests box below for sizing and special requests for any color combinations of stones of your choice.